What Does Code P0003 Mean? The diesel fuel system contains a low-pressure and high pressure side. The low pressure side consists of the tank, pump, filters, water separator, bleeder valves and necessary fuel lines. The high pressure side varies according to injection type, but typically consists of a high pressure pump and fuel rail. 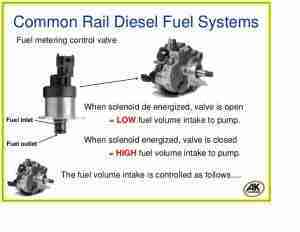 The fuel volume control valve (FVCV) is found on high pressure pump on most modern common rail diesel engines. 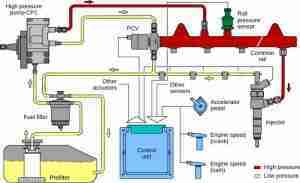 It regulates the volume of fuel from the internal transfer pump to the high pressure pumping components. The valve adjusts the low pressure side of the system to meet the demands of the engine. The FVCV is a duty cycle controlled solenoid controlled by the PCM. One side of the solenoid receives battery power, and the other is intermittently grounded by the PCM. The combination of the FVCV and the fuel pressure control valve (FPCV) is used to correctly supply fuel to the engine. The fuel pressure sensor monitors FVCV and FPCV operation and informs the powertrain control module (PCM) of any changes. The code P0003 stands for fuel volume regulator control circuit. The PCM monitors the state of the FVCV circuit and sets this code when it finds a low circuit. What are the common causes of code P0003 ? What are the symptoms of code P0003 ? Besides an illuminated check engine light, there are other symptoms that might accompany a P0003 code. These include lack of power and a no start condition. How do you troubleshoot code P0003 ? Perform a visual inspection of the FVCV and connection. Many problems can easily be found in the harness and connectors. So, begin your diagnosis by visually inspecting the FVCV and its connection. After the visual inspection, the next step is to test the FVCV. Do this by connecting a current probe to the power supply wire. With the engine running, current draw should be between 35 to 80 MA depending on the manufacturer. You can also test the internal resistance of the FVCV solenoid. Touch a meter lead to each terminal on the solenoid. Consult the manufacturer’s specifications for acceptable resistance value. Anything great than specification or a reading of out of limits (OL), means the FVCV solenoid is bad and should be replaced. While testing the FVCV can be done with a multimeter, it is even better to test it with an oscilloscope. Using a scope, the FVCV should produce a nice, square duty cycle waveform. If the FVCV checks out OK, but you still have P0003 code illuminated, you’ll need to check the circuit. The FVCV will have two wires going to it: power and PCM controlled ground. Consult the repair manual for your vehicle to determine which wire is which. Disconnect the FVCV connector and touch one end of a test light to the B+ pin. Connect the test light clamp to the battery negative post. The test light should illuminate. If it does not, there is problem in the power supply circuit and you will need to consult the factory wiring diagram. Finally, check that the PCM is grounding the negative side of the circuit. Disconnect the FVCV connector and touch one end of a test light to the ground pin. Connect the test light clamp to the battery positive post. Crank the engine. If the PCM is grounding the circuit, the test light should flash. If it does not, there is either an open in the ground side of the circuit or problems with the PCM. None found. Ask a question about P0003. where can I go to find out what the codes mean for my 1994 ford Taurus GL with the 3.0 in it.